The Prevail® Bariatric Adult Brief comfortably stretches and fits bariatric-sized wearers up to 94 inches. Features Dual Refastening Strips for a strong closure that will stay in place even under stress. Improves product performance and wearer comfort with faster absorbency and leakage protection. Ventilated areas allow air to freely migrate to the wearer, helping maintain skin wellness and comfort by reducing heat build-up. The ELF® closure system grips and holds without being sticky. 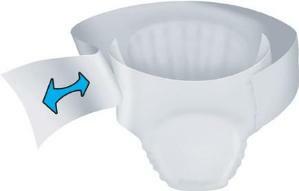 The entire outer cover of the brief being a refasten zone, allowing for multiple tab refastening for improved fit, accurate sizing and cost savings through reduced waste. Wide, Soft, Stretchy Side panels for a more secure comfortable fit. Helps prevent odors from forming for add discreetness.